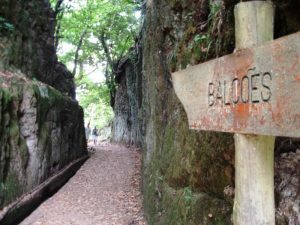 There is a short levada / verada walk (PR11) which offers a great reward and its name is Balcoes. 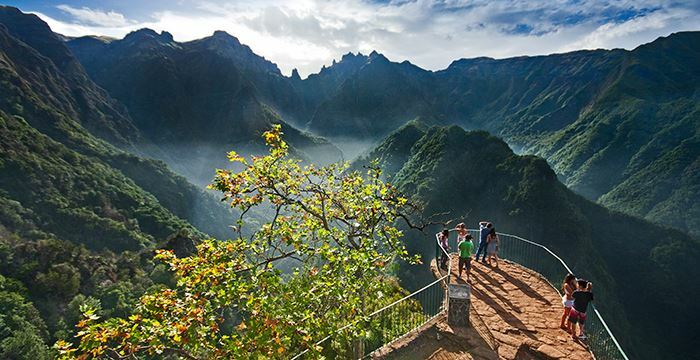 But the easy walk begins in Ribeiro Frio in Madeira’s North. Ribeiro Frio is well known for its trout farm. 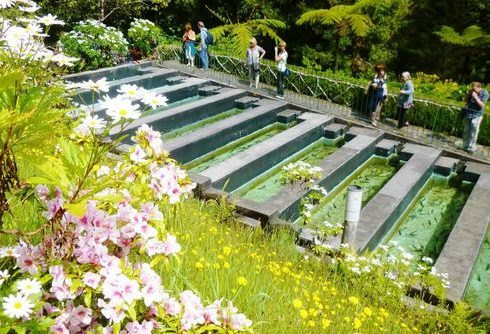 The Ribeiro Frio trout farm is worth a visit, located in a beautiful park like setting, surrounded by an emerald green forest. 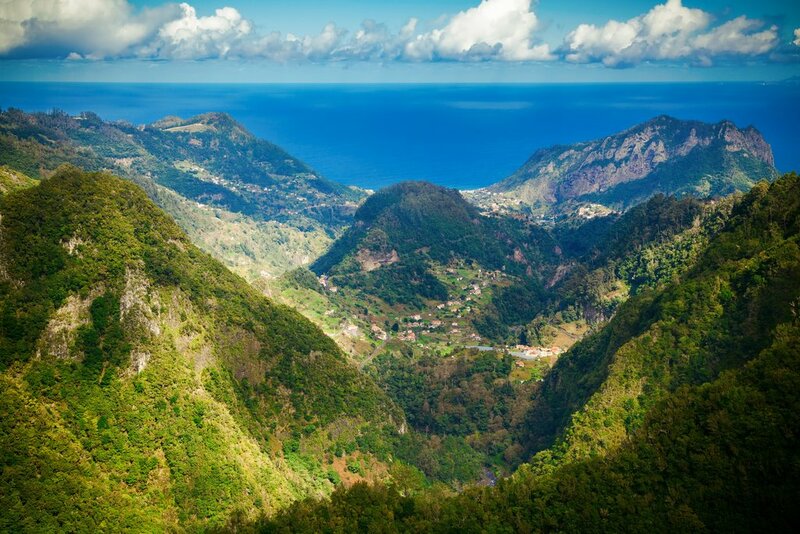 The fish are happily swimming is fresh water tanks fed continuously by pristine levada water. If you want, do indulge in freshly prepared trout in the nearby restaurant. The trout farm is also the beginning of three nice walks. The shortest of them all is the walk to Balcoes. The path is wide and walkable even for someone who is not particularly fit or for those pushing a baby stroller. The views at the end are grandiose, so we recommend it also for experienced hikers and thrill seekers. During the short (50-60 minutes return) walk, you will actually be inside the Laurisilva Forest (classified World Heritage by UNESCO). Since you walk at relatively high altitude (850m), it is best to take adequate clothing along (warmer clothes than in Funchal or Ponta Delgada for example). 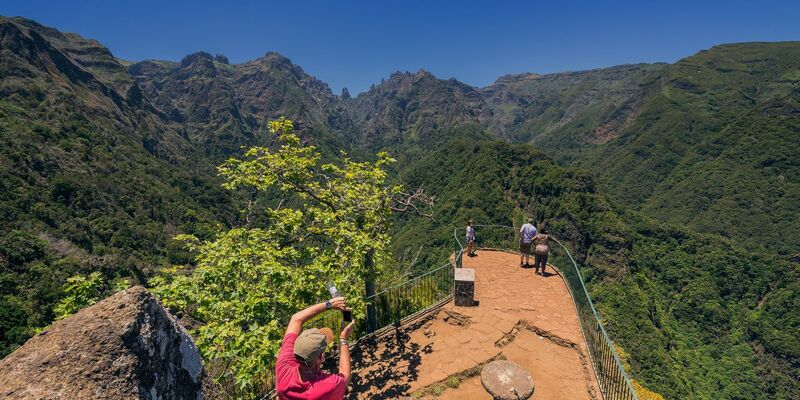 Left and right along this easy walk you can see endemic plants of Madeira: more info is available here and here. As you near the end of the Balcoes walk, the forest gives way to a magnificent balcony inside a circular theater of lush greenery, Madeira’s highest peaks, Penha d’Aguia (Eagle Rock) in the parish of Santana and the Ocean. This balcony with its dazzling views is definitely a picture-taking opportunity. 360 degres panoramic view of Balcoes – requires Flash – click here. If you like birds, you will also like this walk as it is a perfect bird watching occasion. You can witness endemic birds such as for examples the Madeira chaffinch and trocaz pingeons. Enough said! Witness it for yourself through these few pictures.